General Directions: DIRECTIONS: PREHEAT OVEN TO 400 DEGREES. COMBINE PACKAGE(S) IN A BOWL WITH 1/2 CUP WATER. STIR UNTIL MOISTENED. DROP BY A HEAPING TABLESPOON ONTO A LIGHTLY GREASED COOKIE SHEET. BAKE 11 TO 14 MINUTES OR UNTIL DONE. THESE SCONES CAN ALSO BE ROLLED ON A LIGHTLY FLOURED SURFACE TO 1/2” TO 3/4” THICKNESS AND CUT WITH A SMALL BISCUIT CUTTER. IF DOUGH SEEMS DRY, ADD 2 TABLESPOONS MORE OF WATER. 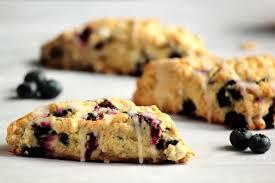 This is my favorite scone with a combination of blueberries and cream cheese, yummy! 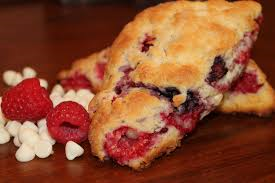 Our scones are quick and easy to make just add water, mix, and bake...then ENJOY!! INGREDIENTS: FLOUR BLEND-ENRICHED BLEACHED FLOUR ((BLEACHED WHEAT FLOUR, MALTED BARLEY FLOUR, NIACIN, IRON, THIAMINE MONONITRATE, RIBOFLAVIN, FOLIC ACID), VEGETABLE SHORTENING (CONTAINS ONE OR MORE OF THE FOLLOWING: CANOLA AND/OR PALM OIL) WITH PRESERVATIVE (TBHQ), LEAVENING (SODIUM ALUMINUM PHOSPHATE, BAKING SODA), BUTTERMILK, CONTAINS 2% OR LESS OF: SALT, SUGAR, CALCIUM CARBONATE, EMULSIFIER (MONOGLYCERIDES)), SUGAR, CREAM CHEESE SEASONING ((CREAM CHEESE POWDER (CREAM CHEESE [PASTEURIZED MILK, CHEESE CULTURE, SALT, CAROB BEAN GUM], NONFAT MILK, CULTURED CREAM, SODIUM CASEINATE, LACTIC ACID, CITRIC ACID, DISODIUM PHOSPHATE, NATURAL FLAVORS, BHA), SUGAR, FRUCTOSE, MODIFIED FOOD STARCH, CITRIC ACID, NATURAL FLAVOR, GUAR GUM, AND LACTIC ACID, LESS THAN 2% SILICON DIOXIDE ADDED TO PREVENT CAKING)) AND BLUEBERRY APPLE NUGGETS (APPLES, NATURAL FLAVORS, CITRIC ACID, ARTIFICIAL COLORS (RED #40 & BLUE #1), SODIUM CITRATE). 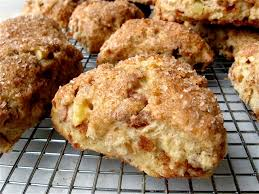 This is a favorite scone with caramel flavoring and apple nuggets. Our scones are not only light & sweet, but they are easy to make; just add water. Easy as 1*2*3. Mix*Drop*Bake. INGREDIENTS: FLOUR BLEND-ENRICHED BLEACHED FLOUR ((BLEACHED WHEAT FLOUR, MALTED BARLEY FLOUR, NIACIN, IRON, THIAMINE MONONITRATE, RIBOFLAVIN, FOLIC ACID), VEGETABLE SHORTENING (CONTAINS ONE OR MORE OF THE FOLLOWING: CANOLA AND/OR PALM OIL) WITH PRESERVATIVE (TBHQ), LEAVENING (SODIUM ALUMINUM PHOSPHATE, BAKING SODA), BUTTERMILK, CONTAINS 2% OR LESS OF: SALT, SUGAR, CALCIUM CARBONATE, EMULSIFIER (MONOGLYCERIDES)), SUGAR, CREAM CHEESE SEASONING ((CREAM CHEESE POWDER (CREAM CHEESE [PASTEURIZED MILK, CHEESE CULTURE, SALT, CAROB BEAN GUM], NONFAT MILK, CULTURED CREAM, SODIUM CASEINATE, LACTIC ACID, CITRIC ACID, DISODIUM PHOSPHATE, NATURAL FLAVORS, BHA), SUGAR, FRUCTOSE, MODIFIED FOOD STARCH, CITRIC ACID, NATURAL FLAVOR, GUAR GUM, AND LACTIC ACID, LESS THAN 2% SILICON DIOXIDE ADDED TO PREVENT CAKING)), dried APPLES and NATURAL FLAVORING. 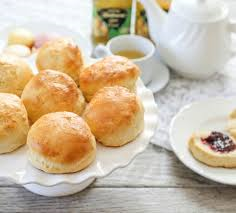 Our scones are light & sweet plus they are easy to make, just add water!! This scone in particular is a wonderful mix of cherries and almonds, YUM! INGREDIENTS: FLOUR BLEND-ENRICHED BLEACHED FLOUR ((BLEACHED WHEAT FLOUR, MALTED BARLEY FLOUR, NIACIN, IRON, THIAMINE MONONITRATE, RIBOFLAVIN, FOLIC ACID), VEGETABLE SHORTENING (CONTAINS ONE OR MORE OF THE FOLLOWING: CANOLA AND/OR PALM OIL) WITH PRESERVATIVE (TBHQ), LEAVENING (SODIUM ALUMINUM PHOSPHATE, BAKING SODA), BUTTERMILK, CONTAINS 2% OR LESS OF: SALT, SUGAR, CALCIUM CARBONATE, EMULSIFIER (MONOGLYCERIDES)), SUGAR, DRIED CHERRIES (RED TART CHERRIES, SUGAR) AND NATURAL & ARTIFICIAL FLAVORING. 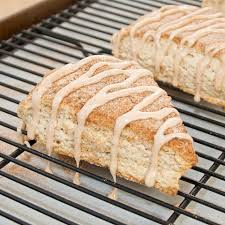 An incredible mix of white chocolate and caramel flavors in our light and sweet scones!! They are easy to make; just add water, mix, and bake. This white chocolate carmel scone makes for a great breakfast item or is perfect as a snack anytime of the day. INGREDIENTS: FLOUR BLEND-ENRICHED BLEACHED FLOUR ((BLEACHED WHEAT FLOUR, MALTED BARLEY FLOUR, NIACIN, IRON, THIAMINE MONONITRATE, RIBOFLAVIN, FOLIC ACID), VEGETABLE SHORTENING (CONTAINS ONE OR MORE OF THE FOLLOWING: CANOLA AND/OR PALM OIL) WITH PRESERVATIVE (TBHQ), LEAVENING (SODIUM ALUMINUM PHOSPHATE BAKING SODA), BUTTERMILK, CONTAINS 2% OR LESS OF: SALT, SUGAR, CALCIUM CARBONATE, EMULSIFIER (MONOGLYCERIDES)), SUGAR, WHITE CONFECTIONERY BAKING CHIPS (SUGAR, PALM KERNEL OIL, NONFAT MILK POWDER, WHOLE MILK POWDER, WHEY POWDER, PALM OIL, SOY LECITHIN (AN EMULSIFIER) AND VANILLA), SALT, AND NATURAL FLAVORING. 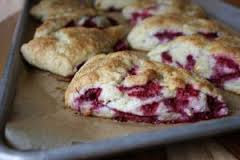 This scone has a great combination of chocolate chips and raspberry nuggets, which is exactly what makes it explode with flavor. Our scones are quick and easy to make; just add water, mix and bake. INGREDIENTS: FLOUR BLEND-ENRICHED BLEACHED FLOUR ((BLEACHED WHEAT FLOUR, MALTED BARLEY FLOUR, NIACIN, IRON, THIAMINE MONONITRATE, RIBOFLAVIN, FOLIC ACID), VEGETABLE SHORTENING (CONTAINS ONE OR MORE OF THE FOLLOWING: CANOLA AND/OR PALM OIL) WITH PRESERVATIVE (TBHQ), LEAVENING (SODIUM ALUMINUM PHOSPHATE, BAKING SODA), BUTTERMILK, CONTAINS 2% OR LESS OF: SALT, SUGAR, CALCIUM CARBONATE, EMULSIFIER (MONOGLYCERIDES)), SUGAR, CHOCOLATE CHIPS (CHOCOLATE LIQUOR, SUGAR, SOYA LECITHIN (ADDED AS AN EMULSIFIER), VANILLIN (ARTIFICIAL FLAVORING)), RASPBERRY APPLE NUGGETS ((APPLES, CITRIC ACID, MALIC ACID, NATURAL FLAVORS, ARTIFICIAL COLORS (RED #40 & BLUE #1)) AND NATURAL & ARTIFICIAL FLAVORING. 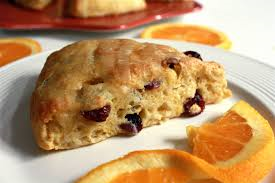 This is our delicious cranberry orange scone. 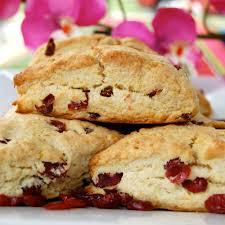 Our scones are easy to make just add water! INGREDIENTS: FLOUR BLEND-ENRICHED BLEACHED FLOUR ((BLEACHED WHEAT FLOUR, MALTED BARLEY FLOUR, NIACIN, IRON, THIAMINE MONONITRATE, RIBOFLAVIN, FOLIC ACID), VEGETABLE SHORTENING (CONTAINS ONE OR MORE OF THE FOLLOWING: CANOLA AND/OR PALM OIL) WITH PRESERVATIVE (TBHQ), LEAVENING (SODIUM ALUMINUM PHOSPHATE, BAKING SODA), BUTTERMILK, CONTAINS 2% OR LESS OF: SALT, SUGAR, CALCIUM CARBONATE, EMULSIFIER (MONOGLYCERIDES)), SUGAR, DRIED CRANBERRIES (CRANBERRIES, SUGAR AND SUNFLOWER OIL) AND NATURAL FLAVORINGS. Our scones are light & sweet. 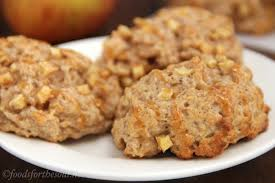 This is my Uncle Edgar's favorite combination of cinnamon and apples! Perfect for a fall treat or anytime of the year! INGREDIENTS: FLOUR BLEND-ENRICHED BLEACHED FLOUR ((BLEACHED WHEAT FLOUR , MAL TED BARLEY FLOUR , NIACIN , IRON , THIAMINE MONO - NITRATE, RIBOFLAVIN, FOLIC ACID ), VEGETABLE SHORTENING (CONTAINS ONE OR MORE OF THE FOLLOWING: CANOLA AND/OR PALM OIL) WITH PRESERVATIVE (TBHQ), LEAVENING (SODIUM ALUMINUM PHOSP HATE, BAKING SODA), BUTTERMILK, CONTAINS 2% OR LESS OF: SALT, SUGAR, CALCIUM CARBONATE, EMULSIFIER (MONOGLYCERIDES)), SUGAR, DRIED APPLES AND CINNAMON. 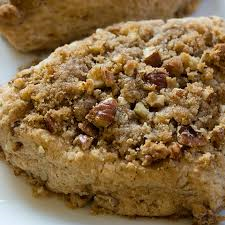 Cinnamon and pecan scone with sugar sprinkled on top. Fantastic treat warm from the oven! INGREDIENTS: FLOUR BLEND-ENRICHED BLEACHED FLOUR ((BLEACHED WHEAT FLOUR, MALTED BARLEY FLOUR, NIACIN, IRON, THIAMINE MONONITRATE, RIBOFLAVIN, FOLIC ACID), VEGETABLE SHORTENING (CONTAINS ONE OR MORE OF THE FOLLOWING: CANOLA AND/OR PALM OIL) WITH PRESERVATIVE (TBHQ), LEAVENING (SODIUM ALUMINUM PHOSPHATE, BAKING SODA), BUTTERMILK, CONTAINS 2% OR LESS OF: SALT, SUGAR, CALCIUM CARBONATE, EMULSIFIER (MONOGLYCERIDES)), PECANS, SUGAR, AND CINNAMON. CONTAINS WHEAT, TREE NUTS (PECANS) AND MILK INGREDIENTS. Cinnamon and raisin flavors that you just can't get enough of. 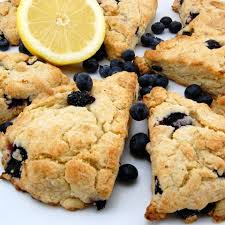 Our scones are light and delicious and make for the perfect snack. INGREDIENTS: FLOUR BLEND-ENRICHED BLEACHED FLOUR ((BLEACHED WHEAT FLOUR, MALTED BARLEY FLOUR, NIACIN, IRON, THIAMINE MONONITRATE, RIBOFLAVIN, FOLIC ACID), VEGETABLE SHORTENING (CONTAINS ONE OR MORE OF THE FOLLOWING: CANOLA AND/ OR PALM OIL) WITH PRESERVATIVE (TBHQ), LEAVENING (SODIUM ALUMINUM PHOSPHATE, BAKING SODA), BUTTERMILK, CONTAINS 2% OR LESS OF: SALT, SUGAR, CALCIUM CARBONATE, EMULSIFIER (MONOGLYCERIDES)), SUGAR, RAISINS AND CINNAMON. Our scones are light & sweet. 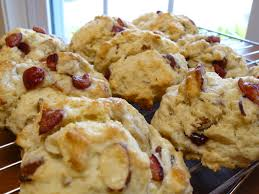 Thisscone mix is beautifully flavored with the perfect amount of both cranberries and orange. Our scones are light & sweet. Enjoy the delicious combination of lemon and blueberry just the right mix. INGREDIENTS: FLOUR BLEND-ENRICHED BLEACHED FLOUR ((BLEACHED WHEAT FLOUR, MALTED BARLEY FLOUR, NIACIN, IRON, THIAMINE MONONITRATE, RIBOFLAVIN, FOLIC ACID), VEGETABLE SHORTENING (CONTAINS ONE OR MORE OF THE FOLLOWING: CANOLA AND/OR PALM OIL) WITH PRESERVATIVE (TBHQ), LEAVENING (SODIUM ALUMINUM PHOSPHATE, BAKING SODA), BUTTERMILK, CONTAINS 2% OR LESS OF: SALT, SUGAR, CALCIUM CARBONATE, EMULSIFIER (MONOGLYCERIDES)), SUGAR, NATURAL FLAVORINGS, AND BLUEBERRY APPLE NUGGETS (APPLES, NATURAL FLAVORS, CITRIC ACID, ARTIFICIAL COLORS (RED #40 & BLUE #1), SODIUM CITRATE). 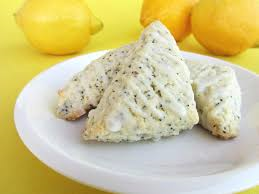 A delightful lemon flavored scone with cream cheese and sugar sprinkled on top. Quick and easy to prepare. SUGAR, FRUCTOSE, MODIFIED FOOD STARCH, CITRIC ACID, NATURAL FLAVOR, GUAR GUM, AND LACTIC ACID, LESS THAN 2% SILICON DIOXIDE ADDED TO PREVENT CAKING)). Our scones are light & sweet and easy to make just add water. These have a refreshing amount of lemon flavor to them. INGREDIENTS: FLOUR BLEND-ENRICHED BLEACHED FLOUR ((BLEACHED WHEAT FLOUR, MALTED BARLEY FLOUR, NIACIN, IRON, THIAMINE MONONITRATE, RIBOFLAVIN, FOLIC ACID), VEGETABLE SHORTENING (CONTAINS ONE OR MORE OF THE FOLLOWING: CANOLA AND/OR PALM OIL) WITH PRESERVATIVE (TBHQ), LEAVENING (SODIUM ALUMINUM PHOSPHATE, BAKING SODA), BUTTERMILK, CONTAINS 2% OR LESS OF: SALT, SUGAR, CALCIUM CARBONATE, EMULSIFIER (MONOGLYCERIDES)), SUGAR, NATURAL FLAVORING AND POPPY SEEDS. 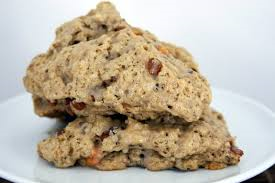 This light scone has the perfect combination of maple flavor and pecans that you won't be able to get enough of. 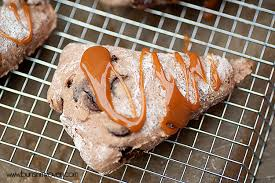 This flavorful scone is perfect anytime of the day. INGREDIENTS: FLOUR BLEND-ENRICHED BLEACHED FLOUR ((BLEACHED WHEAT FLOUR, MALTED BARLEY FLOUR, NIACIN, IRON, THIAMINE MONONITRATE, RIBOFLAVIN, FOLIC ACID), VEGETABLE SHORTENING (CONTAINS ONE OR MORE OF THE FOLLOWING: CANOLA AND/OR PALM OIL) WITH PRESERVATIVE (TBHQ), LEAVENING (SODIUM ALUMINUM PHOSPHATE, BAKING SODA), BUTTERMILK, CONTAINS 2% OR LESS OF: SALT, SUGAR, CALCIUM CARBONATE, EMULSIFIER (MONOGLYCERIDES)), SUGAR, ENGLISH TOFFEE ((SUGAR, BROWN SUGAR, GLUCOSE, MARGARINE (LIQUID AND PARTIALLY HYDROGENATED SOYBEAN OIL, WATER, SALT, WHEY SOLIDS, SOY LECITHIN, VEGETABEL MONO & DIGLYCERIDES, SODIUM BENZOATE (A PRESERVATIVE), NATURAL & ARTIFICIAL FLAVORS, BETA CAROTENE (COLOR), VITAMIN A PALMITATE ADDED), PARTIALLY HYDROGENATED COTTONSEED OIL, SALT, LECITHIN, MAY CONTAIN TRACE AMOUNTS OF ALMONDS, PECANS, CASHEWS, PEANUTS, MACADAMIAS)), ARTIFICIAL FLAVORING AND PECANS. CONTAINS WHEAT, TREE NUTS, SOY AND MILK INGREDIENTS. 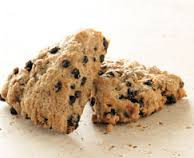 Our scones are not only light & sweet, but they are easy to make; just add water, mix and bake. 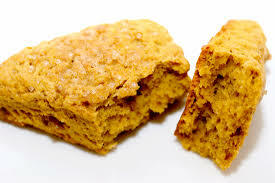 Our pumpkin pie scone will leave you thinking about Thanksgiving and pumpkin pie! INGREDIENTS: FLOUR BLEND-ENRICHED BLEACHED FLOUR ((BLEACHED WHEAT FLOUR, MALTED BARLEY FLOUR, NIACIN, IRON, THIAMINE MONONITRATE, RIBOFLAVIN, FOLIC ACID), VEGETABLE SHORTENING (CONTAINS ONE OR MORE OF THE FOLLOWING: CANOLA AND/OR PALM OIL) WITH PRESERVATIVE (TBHQ), LEAVENING (SODIUM ALUMINUM PHOSPHATE, BAKING SODA), BUTTERMILK, CONTAINS 2% OR LESS OF: SALT, SUGAR, CALCIUM CARBONATE, EMULSIFIER (MONOGLYCERIDES)), SUGAR, CINNAMON AND NUTMEG. 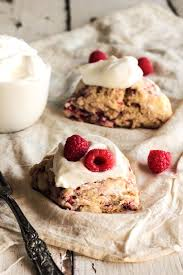 This combination of raspberries and cream cheese is one of my favorite scone flavors. It is light and sweet and makes for a great breakfast option or just a quick treat throughout your day. INGREDIENTS: FLOUR BLEND-ENRICHED BLEACHED FLOUR ((BLEACHED WHEAT FLOUR, MALTED BARLEY FLOUR, NIACIN, IRON, THIAMINE MONONITRATE, RIBOFLAVIN, FOLIC ACID), VEGETABLE SHORTENING (CONTAINS ONE OR MORE OF THE FOLLOWING: CANOLA AND/OR PALM OIL) WITH PRESERVATIVE (TBHQ), LEAVENING (SODIUM ALUMINUM PHOSPHATE, BAKING SODA), BUTTERMILK, CONTAINS 2% OR LESS OF: SALT, SUGAR, CALCIUM CARBONATE, EMULSIFIER (MONOGLYCERIDES)), SUGAR, CREAM CHEESE SEASONING ((CREAM CHEESE POWDER (CREAM CHEESE [PASTEURIZED MILK, CHEESE CULTURE, SALT, CAROB BEAN GUM], NONFAT MILK, CULTURED CREAM, SODIUM CASEINATE, LACTIC ACID, CITRIC ACID, DISODIUM PHOSPHATE, NATURAL FLAVORS, BHA), SUGAR, FRUCTOSE, MODIFIED FOOD STARCH, CITRIC ACID, NATURAL FLAVOR, GUAR GUM, AND LACTIC ACID, LESS THAN 2% SILICON DIOXIDE ADDED TO PREVENT CAKING)), RASPBERRY APPLE NUGGETS (APPLES, CITRIC ACID, MALIC ACID, NATURAL FLAVORS, ARTIFICIAL COLORS (RED #40 & BLUE #1)) AND NATURAL & ARTIFICIAL FLAVORING. What could be better than a snickerdoodle cookie? A snickerdoodle scone!! CARBONATE, EMULSIFIER (MONOGLYCERIDES)), SUGAR, AND CINNAMON. This is our fantastic, traditional scone mix that works great as a snack and can go along great with any meal.Our scones are not only light & sweet, but they are easy to make; just add water. Easy as 1*2*3. Mix*Drop*Bake. INGREDIENTS: FLOUR BLEND-ENRICHED BLEACHED FLOUR ((BLEACHED WHEAT FLOUR, MALTED BARLEY FLOUR, NIACIN, IRON, THIAMINE MONONITRATE, RIBOFLAVIN, FOLIC ACID), VEGETABLE SHORTENING (CONTAINS ONE OR MORE OF THE FOLLOWING: CANOLA AND/OR PALM OIL) WITH PRESERVATIVE (TBHQ), LEAVENING (SODIUM ALUMINUM PHOSPHATE, BAKING SODA), BUTTERMILK, CONTAINS 2% OR LESS OF: SALT, SUGAR, CALCIUM CARBONATE, EMULSIFIER (MONOGLYCERIDES)) AND SUGAR.